Learning about 2D shapes is a must for every early childhood classroom. I’m here to share with you my favorite, go-to 2D shapes activities! Some teachers may do a shapes theme or unit (like me), some may do a shape of the week, and some sprinkle in shape activities all year long. These activities will work for all types of classrooms and teaching styles! Grab your lesson plan binder, and let’s get started! Want all shape printables now? You can find them in my Shapes Unit on TPT HERE. When setting up a shape activity, the first thing I do is go into my supply closet and pull out all my shape games, manipulatives, and puzzles. Pattern blocks, shape cookies, and shape magnet blocks are distributed into various classroom centers. Students need to be playing, manipulating and creating with shapes all over the classroom, not just in the math center! I love this 2D & 3D shape building set! It’s a ton of fun and comes with shape cards. Toothpick Shapes are a fun and interactive way to learn shapes! Students can make shapes with toothpicks and play dough or marshmallows. When teaching your little learners about shapes, it’s important to teach about the sides and vertices too. Use those big vocabulary words! Feel, touch and count the number of sides and vertices a shape has. Don’t forget that a circle doesn’t have any sides or vertices! In the discovery center, I set up a shapes exploration table. The wall has shape posters with real photographs, the back of the table is lined with shape building cards and manipulatives and translucent shapes. There is a sorting board with shape flashcards on top. It’s just a poster board I made with tape. Super simple! The basket is filled with real objects and shape cards students can sort. This exploration table gives students the opportunity to talk about, touch, feel, build, and manipulate shapes with a peer or independently. Shape Building Blocks Cards! This is a close up of the building block shape cards. Students use the blocks to create the shape on the card. After the shape theme is over, put the shape building cards in with your manipulatives or STEM drawers! Geoboard shape cards! I put these shape geoboard cards in my geoboard basket. Students can make the shapes with loom bands on the geoboard. To introduce this activity, I put it out for table time as an arrival activity. It’s also great to build those little fine motor muscles too! Shape cover up! Cover up is a fun game to practice matching shape! Students spin the spinner and cover the matching shape. I love these translucent spinners for my math games. This game is in my Shapes pack. It comes in four different levels. Shapes graph it! This is another fun shapes game that my students love. It’s also a great opportunity to talk about more, less and equal to. Try using magnet bingo chips to cover the graph then using a magnet wand at the end to make the game even more exciting. This shape sensory table is filled with shaped manipulatives and a few cupcake pans for sorting. It has foam shape beads, shape chains and translucent shapes. Perfect for sorting, lacing, and linking together. And you guessed it, it’s great for their fine motor, too! Shape sort! Transition activities are the perfect time to do a quick assessment or learning check. We have snack after music and movement time. I always plan a transition activity for that time for several reasons. The first is so the whole class isn’t lined up at the same time to wash their hands, which is just asking for crazy behaviors to occur. The second is because it’s another time I can squeeze in more learning! What I do is call on a student and give them a card to sort. It’s a quick and easy way for me to check and see if they know or don’t know a shape. Sand writing trays with shape flashcards! Students can write and draw shapes in the sand. This tray is from a lacing set but you can use any small tray you have. I know some teachers use foil pie plates or kid plastic divided dinner plates for writing trays. Shape mini books! After we make a shape mini books together during small group or table time, I put them in the center. They LOVE making them! Staplers scare me a bit with my little learners so I put in this stapleless stapler! It’s amazing! Shapes emergent reader! For a small group activity, students create their own shape emergent reader. After they are complete and we have read them a few times together, they are put in the library center for students to read. My students LOVE play dough trays so I try to make one for each theme we do. In this activity, they create play dough shape monsters. Students use the shape cookie cutters to create the body. Then add arms, legs, eyes and hair using cut up pipe cleaners, small popsicle sticks, toothpicks, and googly eyes. The tray is from the Dollar Tree. Play dough shape mats! Students can create play dough shapes on these shape mats. They can make the shape by rolling play dough snakes or by molding the dough. Shape Prints! It’s great fine motor and makes beautiful pieces of art for your classroom. We cut up paper towel tubes for this circle printing project. We printed with wooden shape blocks too! Shape collages! It’s important to provide activities for students to create new items using shapes. In fact, it’s a learning objective/standard in many states. Students need to be able to manipulate shapes to create new shapes, objects or pictures. Shape collages are the perfect activity to address this learning objective. Single shape collages! 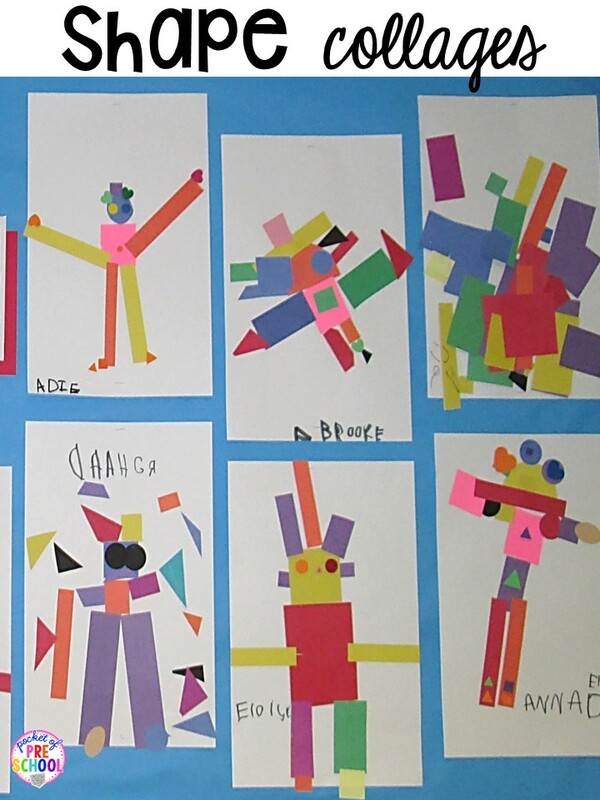 You can also have students create shape collages using just one kind of shape. One year my students were struggling with triangles so we created triangle shape collages. Students were finding triangle shapes, talking about triangles (how they are alike and different), and making pictures with triangles! Make learning about shapes FUN by providing your students with hands-on learning experiences and play! Want all the 2D Shape printables in this post? Click HERE to grab my Let’s Learn About Shapes pack from my TPT store. It’s packed with 180 pages of shape building cards (legos, geoboards, popsicle stick, toothpick, play dough), posters, sorting mats, worksheets, games & MORE. Check out this Shape Book List! It has my top 25 shape books that I’m sure your students will love listening to at circle time. Love these shape activites? Pin this image!